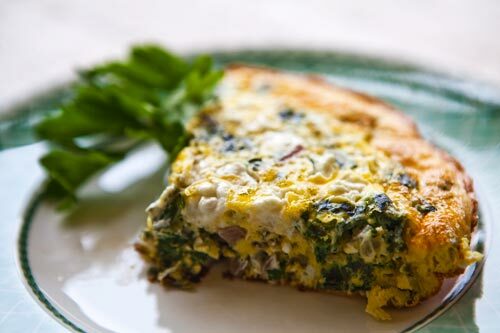 No flipping required in this quick to prepare, hearty frittata that provides an extra portion for quick reheating on an especially busy morning. 1. Heat olive oil in a heavy 12-inch flame-proof skillet over medium-high heat. 2. Add ham and spinach, stir to combine, reduce heat to low and cook, covered, until spinach leaves have wilted, about 3 minutes. 3. In a medium bowl whisk together eggs, egg whites, thyme, and parsley with a pinch of salt and pepper. Pour egg mixture into skillet, use a spatula to distribute ham and spinach evenly, and cook, covered, over medium-low heat until bottom is browned and eggs are almost set, 6 to 8 minutes. 4. Place the skillet under a broiler set on low to finish cooking top of frittata, about 2 minutes. 5. Use a metal spatula to loosen sides and bottom, slide onto a warm platter, and serve immediately. You don't have to be a Texas Fit Chick to take advantage of the plan! Our boot camps will get you into shape - 5 weeks at a time...start this Monday and get results, guaranteed!